WELCOME to the website for CarvedStrings. CarvedStrings is the US trading name for the instrument maker and woodcarver Alice Margerum. 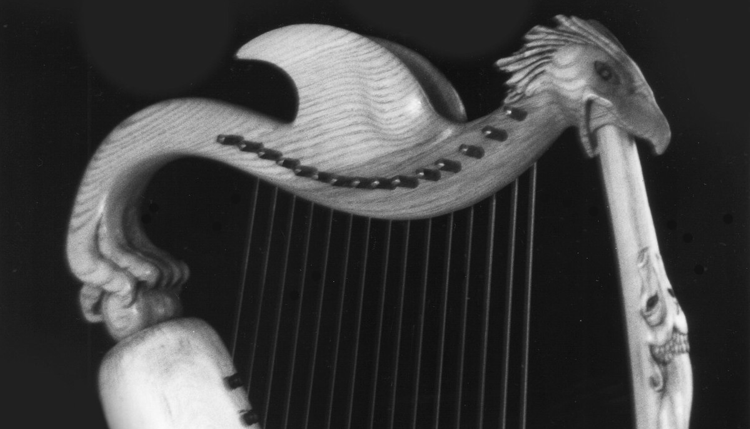 From time to time, CarvedStrings also carries instruments designed and/or built by Tim Hobrough (the retired harpmaker with whom Alice trained in Scotland). This website is usually a bit out of date. Alice is more comfortable working with wood and strings and often forgets to upload the most recent changes. July&Aug. I am planning to be in the UK during the later summer of 2016 and could bring a few harps over if I know there are orders... Please send an email in advance if you would would like to arrange a viewing. WE HAVE MOVED! As of 2012 I have been living in Hancock, Michigan, on the Keweenaw Peninsula, the northernmost part of Michigan’s upper peninsula. The reason for the move is that Alice’s husband is now teaching at Michigan Tech University. PhD AVAILABLE ONLINE - The text of Alice’s PhD thesis, “Situating the Citole circa 1200-1400”, is now available for free from the British Library’s Electronic Thesis Online Service (EThOS). Unfortunately, volume 2, which has all the images and the full quotations with citation to particular manuscripts, has limited access. Please note that the official date for the thesis is 2010, since that is when the work was submitted (yes, the defense was 17 months after submission). If you wish to phone us, our home landline number is: 906-483-3598. If you would like to visit Alice in her workshop in the upper peninsula of Michigan, please contact her by email or phone to make an appointment. Thank you.